Globular cluster 47 Tuc: A beehive of stars seen in the infrared. Normally, I’d dig way into the science of an astronomical picture, telling you this and that about it, probing it in various way and finding fun little tidbits about it to make it even cooler. 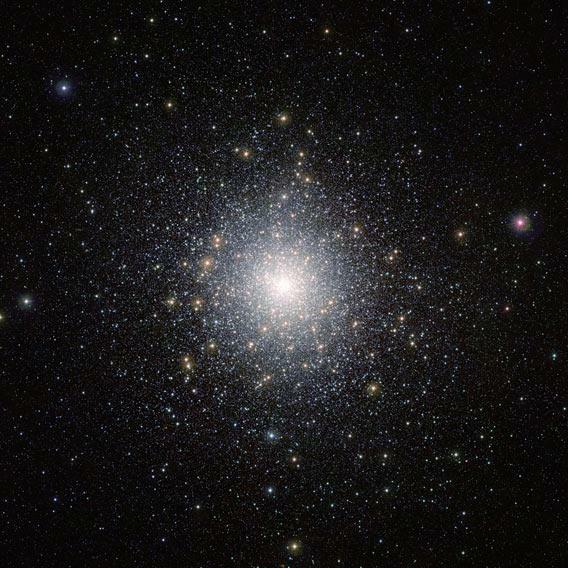 The incredible globular cluster 47 Tucanae, home to over a million stars. Click to enapianate. Now, I’ll note that if you actually believed what I wrote above the picture, you’re hopelessly naive, because I have to mention a couple of things here. One is that this picture was taken by the VISTA (Visible and Infrared Survey Telescope for Astronomy), a four-meter telescope equipped with (get this) a 67 megapixel infrared detector. It examines the southern sky, and was making a survey of a couple of small companion galaxies to the Milky Way when this shot was taken. 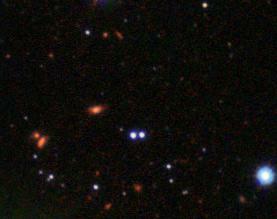 47 Tuc happens to be in the sky somewhat nearby one of these galaxies, so VISTA caught it by accident, more or less. In other words, this devastatingly gorgeous picture was taken because 47 Tuc just happened to be in the way. 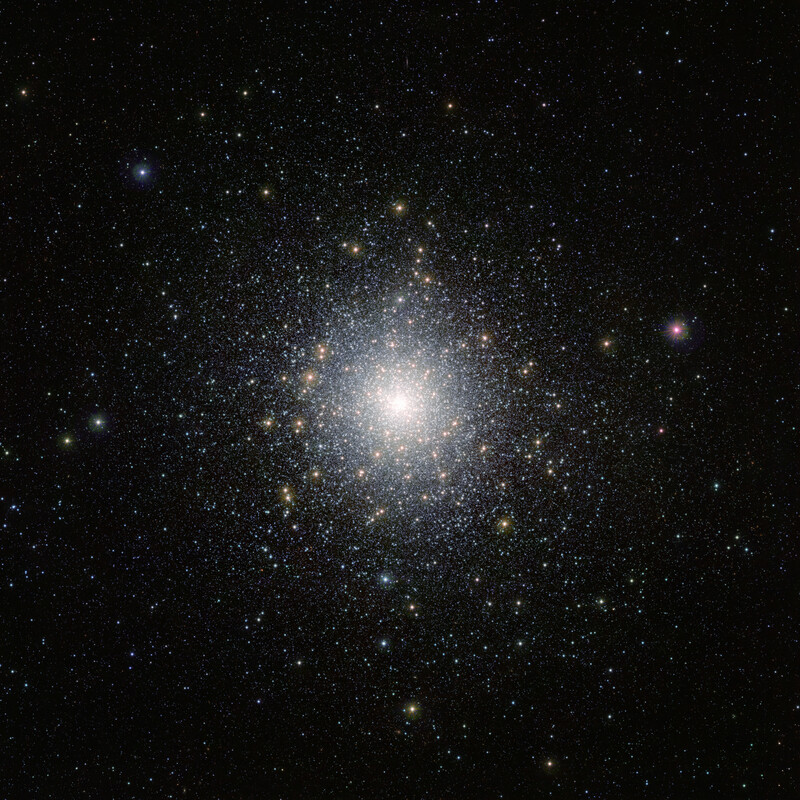 Another thing I have to bring up is that globular clusters, of which 47 Tuc is one, are collections of hundreds of thousands or even millions of stars held together by their mutual gravity. They orbit the center of the cluster every which way, like bees flying around a beehive. They’re surprisingly small; 47 Tuc is the second biggest of more than 150 globulars orbiting the Milky Way galaxy, and it’s only about 120 light years across. That’s big compared to, say, my back yard, but when you have millions of stars to cram in there it’s a pretty tight fit. The density of stars in it is far higher than in our solar neighborhood, where the nearest star is over four light years distant. Just a quick eyeball estimate yielded something like a few hundred thousand stars visible just in this image. Yegads. In fact, globulars are one of the rare places in the Universe where stellar collisions happen. Out here in the galaxy, the odds of any two stars getting close enough to affect each other are very small. But in a globular, it happens all the time. For example, there’s an object called a millisecond pulsar, which is formed when a massive star explodes. The core collapses and forms a rapidly spinning neutron star. But if there’s a nearby star, the neutron star can draw material off of it, which spins the neutron star up even more. They can rotate hundreds of times per second—mind you, this is an object with the mass of the Sun, spinning faster than the blades in your kitchen blender! A tiny, tiny portion of the full-res image of 47 Tuc, chosen more or less at random. Pretty much everything red you see here is a tremendously distant galaxy. Millisecond pulsars are rare in the galaxy, but 47 Tuc has nearly two dozen of them! That’s because space is tight inside it, and stars are far more likely to have companions. Still, despite all that, if you get one of the higher-res versions of this image, you’ll see background galaxies right through the cluster. That’s way cool. Stars are small compared to the space between them, even in a globular. If you grab the hi-res image, you’ll see countless faint red smudges tucked in and among the stars; those are entire galaxies at soul-crushing distances of billions of light years. Oh, astronomy. Incredible beauty mixed with incredible science. I’m so glad I devoted my life to this. I wouldn’t have it any other way.